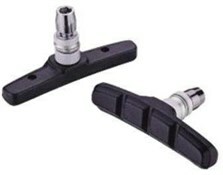 The Ashima V One-Piece Shoe/Pad set contains a pair of ready-to use pads for your bike's v-brake. Each set contains two brake pads, ready assembled with the brake shoe built in, plus all the washers and bolts you need for fitting. Select your colour option and size from the dropdown list to get the right pads for your bike. Suitable for all types of bike with V brakes. Very fast delivery and happy with items. Perfect eith on my 20 inch Dahon folder. Recommended if you want decent no frills pads.